He developed this keen interest in racing the moment I started him on Winalot. I need some help decorating a cake. "How many more times...I don't WANT a drink"
This low budget Ben-Hur remake is a mess. "Score love! We'll eat well for a month!" "Off to the Alpo factory with you." Every dog has it's bay. 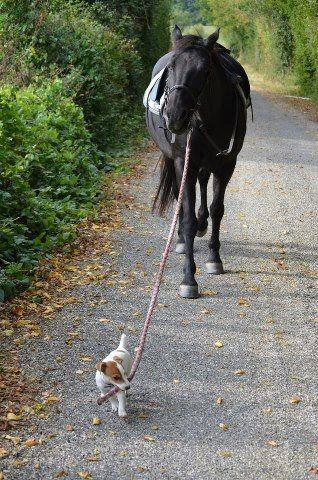 Pony: "I hope you are not leading me into a trap." ".. and Lucky takes the lead." "Can we hurry up a bit? I think I've got the trots." "As soon as we get to the water, I'll teach you how to drink. It's easy." Good dog , well done for watching out for the horse , we are lucky yolu . ar in the neigh bour hood watch. "I do wish he would learn to walk at heel." So this is how Zorro gets his horse to come when he whistles. You can lead a horse to water but you can't make him shrink. "I think he's leading me up the garden path."